« How to start your own blog? Performers that are chosen on this blog are not known by most people (very often they appear only in web). But they are really amazing and it is a pleasure to listen to them! You need to check it by yourself to know what am I talking about. Blog is build with WordPress and K2 Theme. Have fun! The music biz is really tough. Musicians need as many outlets as possible to perform their music. You never know when you’re going to be discovered! 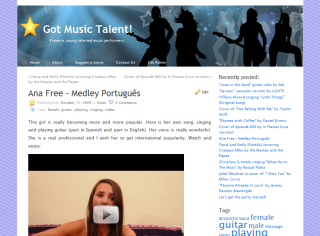 Great to know that you make use of music blog to discover hidden talents. I’m enjoying listening to it!